The Holy Gospel book contains the full text of the four Gospels, marked according to liturgical use in the Orthodox Church. It uses the Eastern/Greek Orthodox Bible (EOB), a formal Modern English translation from the Patriarchal Text of the Ecumenical Patriarchate, the official Greek translation of the Orthodox Church. Designed for both private reading and liturgical use, The Holy Gospel contains an extensive, Pan-Orthodox calendar of liturgical readings; detailed instructions for use; a complete table of moveable dates through the year 2100; translation notes and footnotes; and more. Four ribbon bookmarks make use easy. Attention to design was very important to this project. 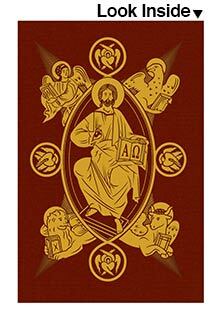 The Gospel Book features beautiful black-and-red printing and gorgeous full-page iconography and ornamentation. Complete with a handsome foil-stamped, cloth-bound hardcover, it is a dignified and holy book worthy of the words of Christ contained within. No home prayer library is complete without The Holy Gospel. It would likewise find a perfect place in a clergy home visit kit, travel altar, or church confessional. Makes a perfect gift for graduates and any occasion. This Gospel is wonderful. Great translation and very easy to read. I hope it is made in a bigger size for use at the Holy Table. The Bible is beautiful and people that sees attracts them and ask to see. Quality, ease to carry around and words are easy to read. Very nice. I use it to read the Gospel reading for every Divine Liturgy. I highly recommend it. Best Available Option for Orthodox Bible reading, hands down. Beautiful, powerful, full of grace, the best English translation available... Everything I could want in a Gospel. Glory to God! I am very pleased with this book of the gospels . It’s a fitting volume for the life and teachings of our Lord and Savior . The quality binding and four ribbon markers sets it apart from so many others . This Holy Gospel is a high quality product. Beautifuly craftet outside. Very good readable letters. Indispensible for every prayer corner at home! This Gospel is easy to follow and understand. It is also beautiful. Thank you so much for making these - i could not be more pleased and look very forward to the publication of the Epistles. Purchase without hesitation - these are very nice! Clear translation. Beautiful layout. Although I would prefer the Greek style layout of specific reading, this book is otherwose a perfect size for communion calls and anointing. And, fortunately includes the readings for Anointing and some other services separately in the back. Prayer Bracelet with Beads and Wooden "Gospel"